Buy-and-hold, as it name suggests, consists of two stages. The first one is a process of choosing and buying one currency with another. The second stage of B&H is a holding period of several years for the bought currency rate to rise against the currency sold. Although there is only "buy" in the name of this strategy, B&H traders are not limited to long side of the trades. Short selling works equally well in the Forex market. Is It Even Possible in Forex? The main argument of the experts, who oppose buy-and-hold in Forex trading, is that currencies lack the main advantage of the stocks. Whereas a company's value may soar hundreds percent up as result of some fundamental event (for example: entering new markets, successful invention, lack of competition, etc. ), currencies cannot rally against each other in a similar way. The only exclusion being third-world currencies devaluating rapidly due to some political or financial turmoil. Of course, those are out this strategy's scope. While this argument is completely valid, it does not remove the possibility of using buy-and-hold with currencies. The lack of rapid growth is easily compensated with extremely high leverage (up to 1:2000), while the inability of currencies to depreciate similarly to shares makes long-term Forex trading more flexible and controllable. One of the possible obstacles for employing B&H strategy is a Forex broker. Firstly, it should be reliable enough to outlive the planned long-term trade, be able to execute the exit trade and transfer the initial investment with profit to trader's bank account. Secondly, it should be willing to hold the trader's position open for that long. The last factor should not be overlooked as the online FX brokers earn from spreads and commission that depend on the frequency of trading. Needless to say that in buy-and-hold this frequency is too low for a broker to earn anything significant. The only possibility for them to benefit from a long-term position is to tune the interest rate payments into their favor. That is why a choice of a broker for a B&H position is almost as important as a choice of currencies. In B&H, using a protective (and, sometimes, trailing) stop-loss can be an advantage. Unlike carry trade, buy-and-hold does not require a stable and growing global economy. While receiving a positive interest rate rollover is a bonus for buy-and-hold positions, it is not a necessary requirement. Good B&H positions need more confirmations and conditions for entering. Positive carry alone is not enough. Trades with positive overnight interest rate payment bring additional profit. Negative overnight interest rate can be a serious problem. Requires a lot of patience (especially if swaps are negative). Broker should be reliable enough to last for years. The choice of a currency pair plays a crucial role in buy-and-hold strategy. Ideally, a currency pair should pay positive swaps in the direction of the trade. But that part can be skipped if negative swap is negligible compared to the expected long-term gain. Fundamental factors should be of high priority here. Long-term considerations, such as central bank policies, global sentiments and trends in unemployment rates could serve as a beacon. A buy-and-hold position should be entered either at minimal leverage or with enough free margin locked in the Forex account to prevent margin call or even stop-out. Trade timing, although can be used to gain some additional advantage, is not as important as in conventional FX trading. Delaying for a pull-back to occur can cost the overall trading opportunity and should be considered only in special cases. A long period of waiting should be employed. It is not uncommon for the Forex B&H positions to last for years and even decades. Exiting a buy-and-hold trade is even trickier than entering. Ideally, a long-term currency investor exits such position only when there is need for capital or the market conditions have changed dramatically. Alternatively, B&H position can be closed when some large profit target or an intolerable level of loss is reached. 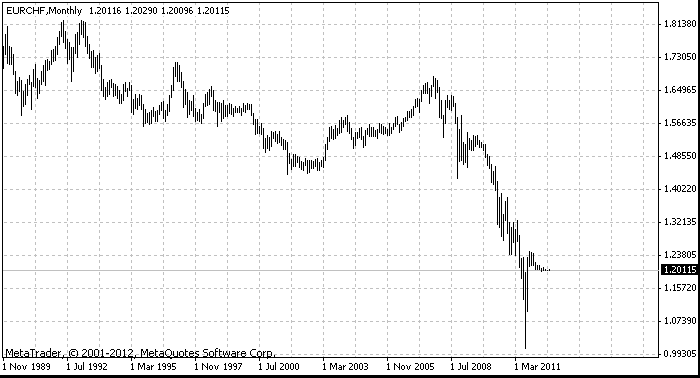 The first example depicts USD/RMB (USD/CNY, US dollar vs. the Chinese yuan or renminbi) currency pair. Which was, and still is, in along-term downtrend thanks to the negative US trade balance with China and slow revaluation of yuan by the People's Bank of China. Not only a long-term investor would profit from a nearly constant currency pair decline, but he would also earn significantly from the positive difference between high Chinese interest rate and low rate used by the Federal Reserve.